fingernails (61%), folded paper or cards (40%), cutlery such as a fork, knife, or spoon (21%), safety pins (14%) or strands of hair (7%)…. A separate ADA member survey found similarly unusual items being used to remove food from between teeth, including twigs, toenails, matchbooks, loose electrical wires, screwdrivers, and pocket knives. Of course, the need to clean between teeth isn’t limited to humans. 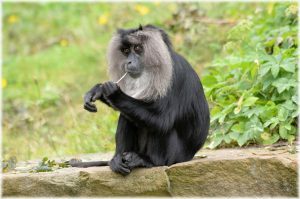 Macaque monkeys also floss – a behavior that seems to be taught by their mothers, who show them how with slow, exaggerated motions. They’ve even been known to pull hair from the heads of humans and fashion it into floss, though they’ve also been seen using coconut fibers or twigs. Do any other animals clean their teeth? In the wild, most animals don’t need to. They eat raw, natural foods and drink only water. They’re not exposed to the kinds of refined sugars and other processed carbs that are in the human diet – and often, the food we feed our pets, as well. Grass-eating animals have a diet very high in fiber. When combined with the extra chewing necessary to digest it, their food itself naturally cleans their teeth. Cats, meanwhile, have their own defense system: saliva with a very high pH that works against demineralization and cavity formation. The shorter lifespans of most animals also mean that their teeth easily outlast them, while some, such as sharks and alligators, go through many sets of teeth through their lifetimes. Rats, mice, and other rodents have teeth that never stop growing, while their constant gnawing behavior continually wears down those teeth. Yet, some animals do practice forms of dental hygiene. In sub-Saharan Africa, for instance, crocodiles will open their jaws wide while resting, and Egyptian plovers will pick out the bits of any food stuck between the crocs’ teeth. Just as animals living a natural lifestyle don’t have nearly as many dental problems as we do, so our own hunter-gatherer ancestors had better teeth than we do – all without the benefit of toothbrushes, toothpaste, and floss. That all changed with the huge dietary shift that accompanied the advent of agriculture. As our diets changed over time — shifting from meat, vegetables and nuts to carbohydrates and sugar — so too did the composition of bacteria in our mouths. As prehistoric humans transitioned from hunting and gathering to farming, certain types of disease-causing bacteria that were particularly efficient at using carbohydrates started to win out over other types of “friendly” bacteria in human mouths. The addition of processed flour and sugar during the Industrial Revolution only made matters worse. Though some hardy souls may try living a hunter-gatherer lifestyle, most of us have neither the ability nor desire to return to it. Instead, we must pay attention to our oral hygiene – preferably with proper tools rather than whatever is at hand.